The only acceptable place where seeing wild animals up close and personal is the zoo. Learning and watching how these animals interact in these controlled settings can make for a fun family activity. Having direct contact with wild animals in and around your home is a different story. Living in Eden Prairie, MN, there are a wide variety of animals that call this part of Minnesota home. If a wild animal has decided to hang out in your yard or has even ventured into your home, calling animal removal professionals is a must! Thankfully, Minnesota Wild Animal Management Inc., offers affordable and humane animal removal services in Eden Prairie MN. Bats – It only takes a very tiny hole for bats to enter your home and attic. Coming into direct contact with a bat is extremely dangerous and should only be handled by individuals with experience. They can often carry disease and inhaling their feces can be harmful as well. 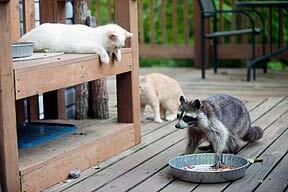 Raccoons – Open trash cans can quickly attract the unwanted raccoons around your home. Although most raccoons are not aggressive, all it takes is one to bite and terrorize your home. Since these animals are nocturnal, it is easy to not notice that they are around until damage has already occurred. Mice – The sight of mice racing across your kitchen floor will leave you with nightmares! Mice can enter your home in the tiniest space, and often times if you see one mouse, others are around. These pests do not need much to survive and can cause significant damage to things like your insulation, attic and wiring. Regardless of the type of wild animal that you are dealing with, removing the pest as quickly as possible should be your number one priority. Offering 24/7 emergency service, all you have to do is make the call to our dedicated staff and we will get the ball rolling on your animal removal needs. With over 35 years of combined animal removal experience, we know the common hiding places and pride ourselves on humanely removing these animals. Our 5 step removal process includes inspecting your entire home, removing the animals, repairing any damage made by the animal and implementing preventative measures so that these animals don’t come back! If you have the urge to see some unique wild animals first hand, book a trip to the zoo. If a wild animal decides to come visit you at your home, contact Minnesota Wild Animal Management, Inc. If you live in Eden Prairie, MN, and need animal removal services, give us a call today at (612) 237-8282.